CALGARY - Beat out by Winnipeg to host Canada's previous Olympic curling trials, Ottawa has won the bid for the 2017 Tim Hortons Roar of the Rings. The men's and women's winners emerging from the Dec. 2-10 trials at the Canadian Tire Centre will represent Canada at the 2018 Winter Olympics in Pyeonchang, South Korea. 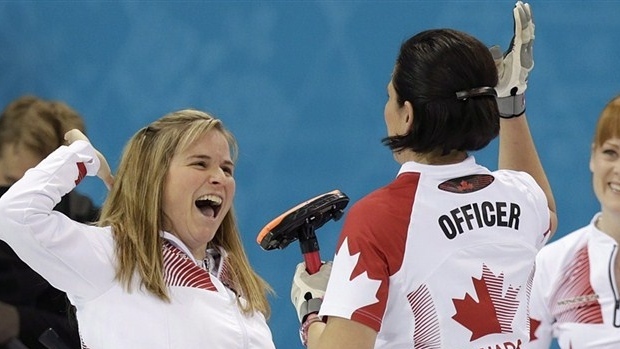 They'll be tasked with defending the gold medals won by Winnipeg's Jennifer Jones and Brad Jacobs of Sault Ste. Marie, Ont., last year in Sochi, Russia. A pre-trials tournament that completes the Roar of the Rings field will be held Nov. 6-12 in Summerside, P.E.I. The event was held in Kitchener in 2013 in a 7,000-seat arena. "We received multiple bids for both properties," Curling Canada chief executive officer Greg Stremlaw said Monday at a news conference in Calgary. Stremlaw didn't reveal the other competing cities for the trials or pre-trials, but Saskatchewan media outlets have reported Saskatoon bid for the trials. Ottawa is also the host city of the 2016 Tim Hortons Brier. The Canadian Tire Centre seats 19,153 and is the home of the NHL's Ottawa Senators. Total attendance at the 15,000-seat MTS Centre at the 2013 trials drew 136,771. Stremlaw said numerous factors made the Canadian capital's bid successful this time: volunteer workforce, the Senators' blessing to use their building, a major airport, host broadcaster TSN's familiarity with the building and the host committee's ability to raise the financial capital to stage it. Credit Union Place in Summerside seats 4,228 for the pre-trials event. "We thought maybe having a slightly smaller building would actually suit that property very well," Stremlaw said. "It was interesting to try and move something to Atlantic Canada. "We were quite encouraged to see a wonderful bid from Summerside, especially for an Olympic qualification event such as that." Jacobs claimed the final pre-trials berth in Kitchener and won his way through it and the main trials en route to Olympic gold. The 2017 pre-trials field already has a few entries with 2014 Canada Cup winners Mike McEwen and Val Sweeting, as well as Jones, who won the Canadian women's title last month. The winner of this week's Brier in Calgary will also gain a pre-trials berth. The formula for determining eligible teams and the event formats will be announced in April. There will be no major changes because the previous system was so successful producing gold medals, Stremlaw said. "It rewards for consistent performance and consistent excellence," he said. "From there we all know it really rewards the hottest teams of both genders that come out of (the trials). "The results have been phenomenal to date. Clearly with the double-gold result and the fact that it's the only (Canadian) sport that's ever been on the podium for every Olympic Games that we've entered, that's a record we're pretty proud of."